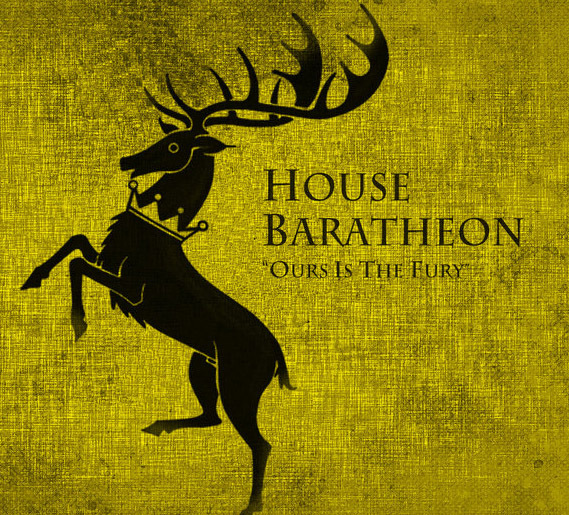 by Blake Stilwell of (according to numerous online Game of Thrones-based personality tests) House Baratheon. I actually believe if House Stilwell had a place in Westeros, our sigil would likely be a fat bear, wearing a bib and drinking two fingers of scotch. I also think this is probably Robert Baratheon’s personal sigil, one he just never talked about. But this isn’t about me, this is a celebration! This month, HBO dropped the latest season of Game of Thrones on Blu-Ray, a gift for which I have already pre-ordered for my mother (it was her Christmas gift. Don’t judge me. I got schmaltzy gifts for her for the past five years and I think she actually liked this much better). Of course I didn’t wait for this to watch. Who possibly could? To celebrate this momentous occasion (and maybe have it available for this year’s premiere of Season Four), As Eaten brings you something as epic as the Game of Thrones theme song: a hearty dish from the North! 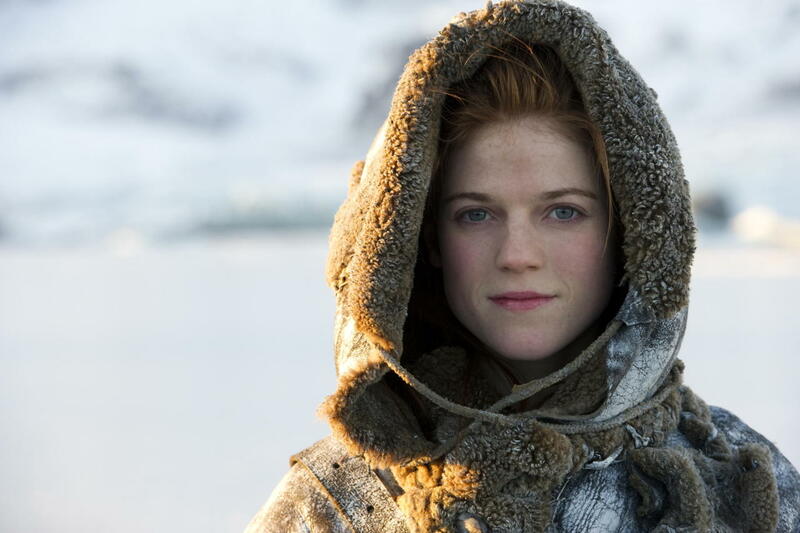 No, not Ygritte. It’s a Beef and Bacon Pie, from the lands around Winterfell! The recipe comes from A Feast of Ice and Fire: the Official Game of Thrones Cookbook by Chelsea Monroe-Cassel and Sariann Lehrer, based on their blog Inn At The Crossroads. This book is more than a recipe book. Its an exhaustively-researched history of food and medieval cookery. It’s a fascinating mix of narrative and historical context. I highly recommend this. It’s so much more than a cookbook. 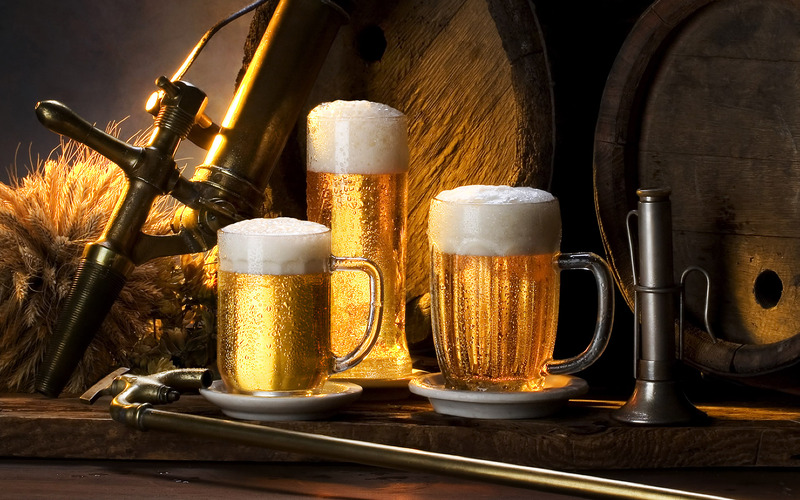 And if you’re throwing a Game of Thrones-themed party, you will not find a better companion! The North of Westeros is a vast, cold place. As such, the food tends to toward what we in the US call “comfort food.” They are heavy, hearty plates, full of meats, gravies, breads, and such. This recipe is no different. The difference is where the comfort food in the US can be bland at times, save the use of salt and pepper, the use of fruits and spices in this meat mixture brings a unique, exotic flavor. It’ll taste better than you think it will. 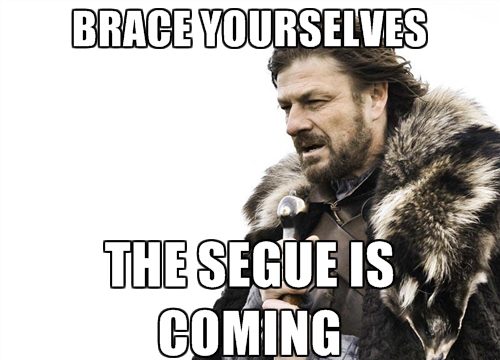 But you’ll need to start with the medieval pastry dough. There is a special recipe, and the first ingredient should be an indicator of the uniqueness of flavors I’m talking about. If it sounds weird that the North of Westeros uses Saffron in its baking doughs, there is a very interesting explanation, based in both the lore of the Game of Thrones universe as well as Medieval History, thoroughly researched and presented to the reader. It’s really a good read. And it’s delicious. Dissolve the saffron in the water. Rub the butter into the flour with your fingers until there are only crumb-sized pieces. Add the egg yolks and saffron water until the mixture is sticky. To pre-bake a shell, line a pan with thin-rolled dough.use a fork to poke holes all over the bottom of the pastry shells. Bake for 10 minutes at 350° F.
The book offers two recipes, a modern version and a medieval version. The recipe I used from this book is more of the medieval sort, which I think more appropriate, given the setting of the show and books. Preheat oven to 375° F. Cook the bacon in a saucepan until the fat runs from it, then drain off the fat. 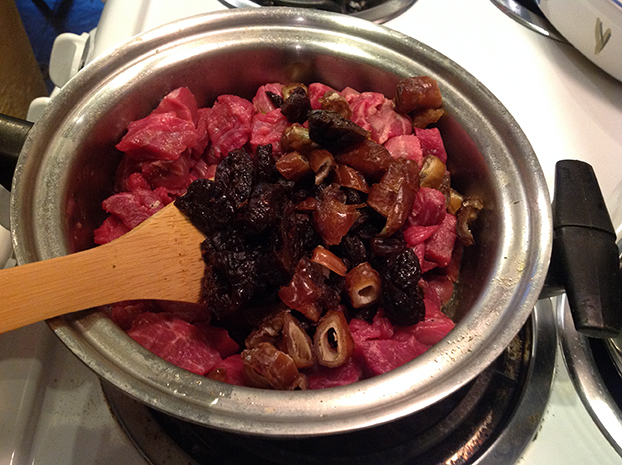 To the bacon pan, add the beef, spices, vinegar, and fruits. Add enough broth to wet the mixture until its runny. Mix in the flour and cook until the juices form a gravy. Cool the mixture. 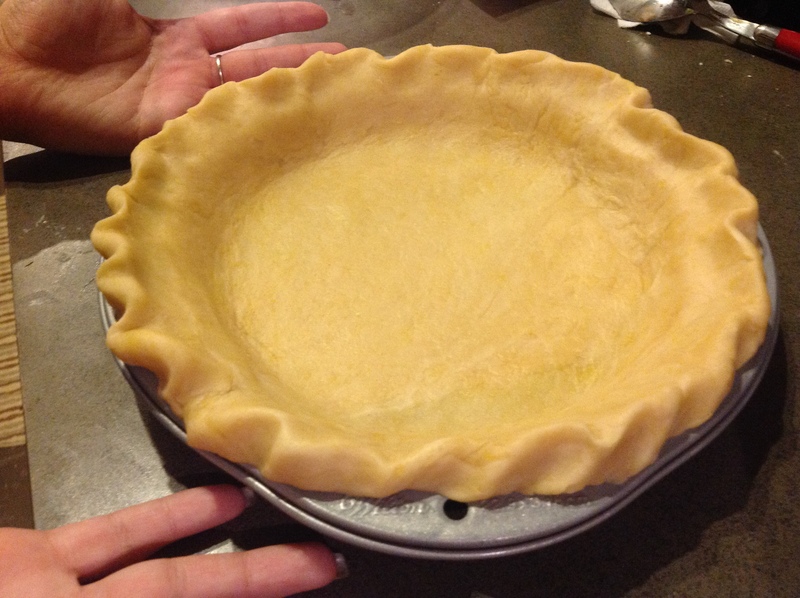 Line a 9-inch pie pan with a pastry dough and fill it with the meat mixture. The book calls for a pastry lid. 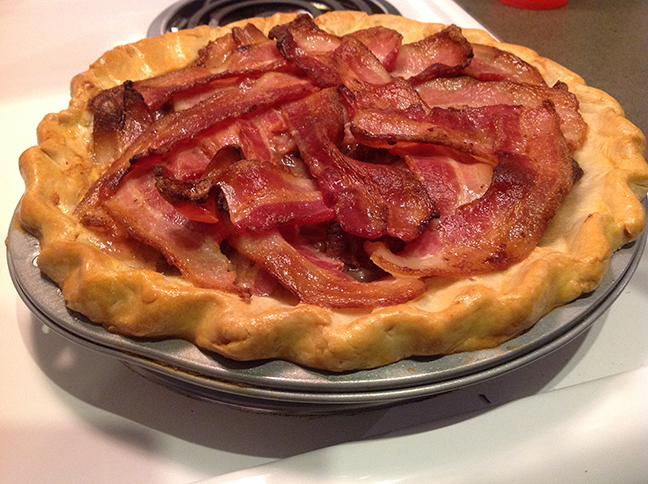 But the book has a great photo of a pie with a bacon lattice lid, so we decided to go with this because it was so much more epic. We used the remaining chewy bacon that wasn’t quite crispy to form the lattice so it would crips in the oven. The fruit will melt as the pie bakes and form a sweet, salty, savory mix of flavors that is absolutely fantastic. Clean and peel the onions. Quarter seven of them and put the rest aside. In a deep frying pan, add the honey, herbs, and quartered onions.make sure the onions get covered with the honey-butter mixture, cook for 8 minutes, browning the onions. Add the cider to the pan in three distinct splashes. let the cider heat between splashes. Sprinkle flour into the pan and form a gravy. 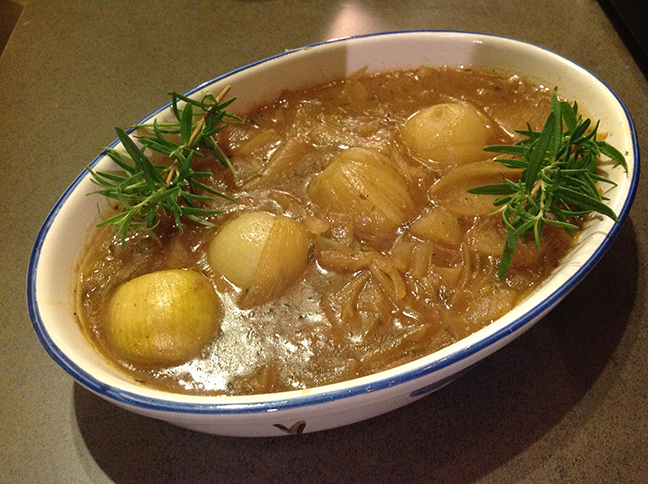 Add the stock and the rest of the onions and bring to a simmer. 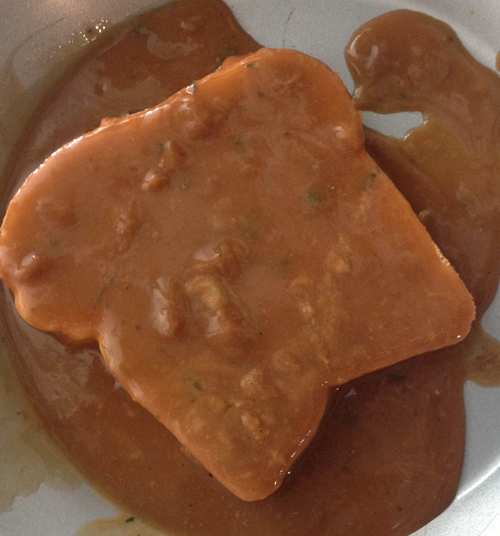 Cook for 5 minutes and reduce until it has a thicker, more gravy-like consistency. Add salt and pepper to taste. We garnished with rosemary because it looked nice and we had some left over. This one-two punch combination of sweet and savory is a filling, hearty meal fit for you or any Stark. Any Stark that may still be alive, that is. It’s not Thanksgiving, and we’re pretty far from November, but after almost two whole months, As Eaten On TV is back and we have much to discuss. We never never stopped cooking, we just couldn’t share… until now. 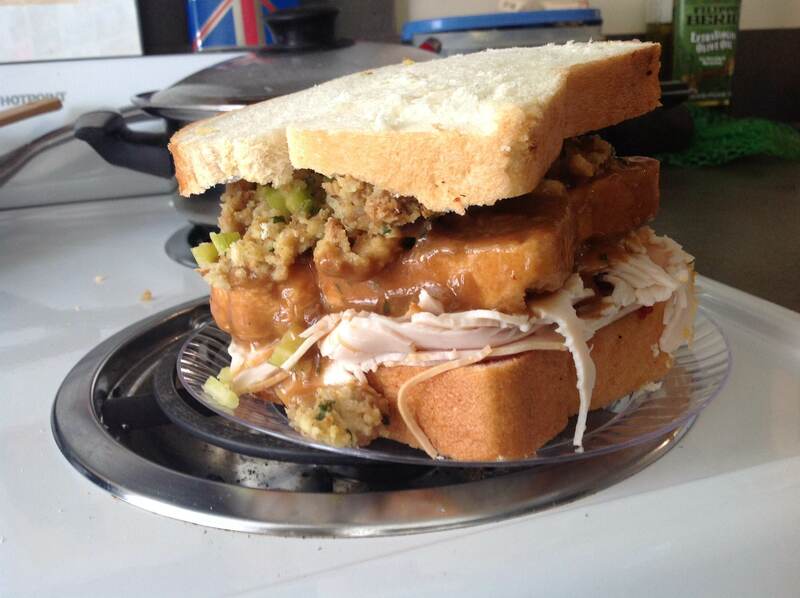 So to give thanks for our return, we turn to a Thanksgiving favorite from the 90’s, The Geller Thanksgiving Leftover Sandwich, complete with the “Moist Maker” (I called it the Geller sandwich, by the way, because though it was popularized by Ross’ insane infatuation with it, it was Monica’s creation. But for simplicity’s sake, we’ll call it Ross’ from now on, because as any avid Friends watcher knows, it’s HIS). 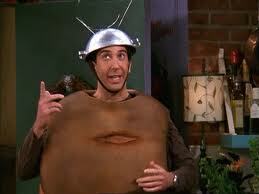 Sadly, this was the beginning of the end for Ross Geller. No, he doesn’t die. His character slowly drifts away into madness, becoming a caricature of what he once was. If this were real life, he’d be in the loony bin by season 8. Conceptually, I avoided adding anything that would not be on the table for Thanksgiving. This is about using leftovers, after all. So I did not add mustard, fresh vegetables or anything else. I see leftover cranberry sauce, because everyone buys it for the ONE PERSON who actually eats it and there’s no way that person would eat it all (that’s why it comes in very small cans, because after a while, even the Ocean Spray people are going to start to feel bad about the sheer volume of wasted cranberry sauce). Stuffing and gravy are included because I feel they are always the most popular part of the meal (at least, this is so in the Midwest, where I grew up, where poultry-flavored carbs and gravy beat the Depression). Mashed potatoes are not included because not everyone who likes the mashed potatoes covers them in gravy. I don’t know why. But they exist. Things like macaroni and cheese, various vegetable dishes and fruit are also not included because there is never any leftover mac & cheese, the vegetables are made for specific people who ask for them and usually don’t make it past the second football game and nobody really wants fruit on Thanksgiving unless its baked into a pie. 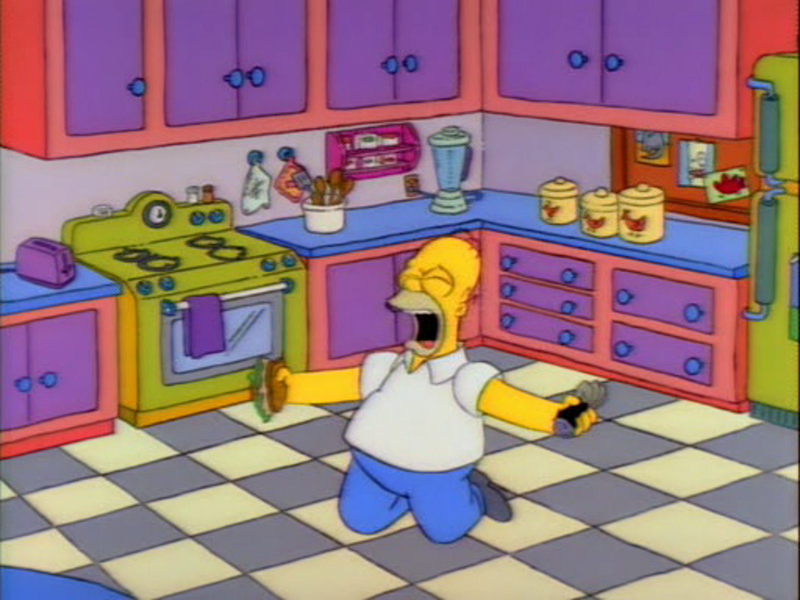 I also didn’t put the sandwich on a roll because Ross specifically mentions that there are three slices of bread. I used a fresh-baked loaf of white bread and this is where your first step should be. Get that bread soaking in the gravy immediately. The Moist Maker is the centerpiece of the sandwich and it’s the only reason I am even writing this post. The longer the Moist Maker soaks, the more moist your sandwich will be when you go to eat it. I used a pie tin. Open the disused can of cranberry sauce (check the expiration date) and spread to two slices of bread. Throw the rest away, don’t even pretend you might use it for something else (and unless you’re reading this on November 20th, no, it will not make it ’til actual Thanksgiving).The rest is fairly obvious. If you wanted to make this without actually cooking a bird and stuffing it, you could just go get some Stove Top and sliced turkey from a deli. On the flipside, if you have that much turkey left over after a meal, you can actually bring your cooked bird to a butcher, deli or grocery store and they will slice it up for you, usually without charge. For a truly leftover experience, put the finished sandwich in the fridge (with a note) for a few hours and really test the ability of the Moist Maker to revive the sandwich. I do have to say that Donald was right in that it’s a large sandwich, a lot of food. I would never have dreamed of throwing it away, though. Saving it to eat later is what this sandwich is all about.